The Messages screen in iOS 12 and iOS 11 is busier than ever before, displaying a row of colorful icons and iMessage apps on the bottom of every conversation in Messages on iPhone and iPad. While some users will love the quick access to their gifs, message stickers and apps, not everyone is satisfied with having a row of brightly colored app icons and the app drawer showing up with their Message conversations, and many professional users have sought out a way to disable or remove the Messages app icons from the iOS communication client. If you’d like to hide the Message app icons in iOS 11 or iOS 12 on an iPhone or iPad, you can do so with a little trick that hides the app drawer. The Messages app drawer and row of icons will stay hidden until it is revealed again by tapping the App Store icon again. 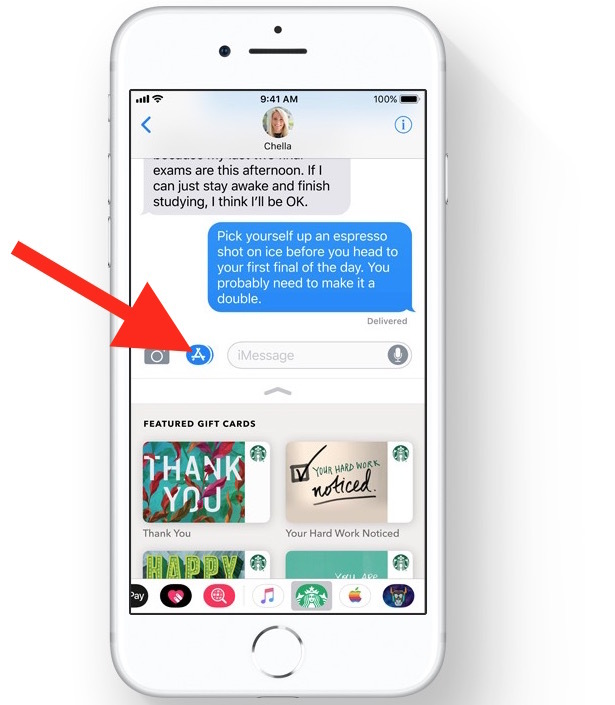 Additionally, if you use an iMessage app or sticker, the Message dock row of icons will appear again, meaning you’ll have to tap the icon to hide it again. If you’d like to see and access the Message app drawer of icons, simply open a message thread then tap on the App Store icon to reveal the iMessage apps and stickers again. * Note that some users have reported that tapping and then swiping down on the App Store icon is necessary to hide the iMessage app drawer. Whether or not the behavior is different per device is not entirely clear, but should you have problems hiding the iMessage apps row with the tap method try the press and swipe gesture instead. This is a less than obvious method of hiding the feature, but like some other parts of modern iOS it’s often a discovery process to learn how to perform a particular function that is discretely implemented. Many users have wandered around searching for an option to disable the app icon drawer in the Messages section of Settings, but there is no app drawer toggle available there, and instead the ability to hide and show the iMessage app drawer is entirely contained within the Messages app itself. The Messages apps and icon drawer was introduced in iOS 11 and persists in iOS 12, so this is likely a permanent addition to the iOS Messages app for iPhone and iPad users, thus learning how to use, hide, and show the Messages icon app bar is probably helpful for many iOS device owners. Thanks to the various readers who emailed or left comments, like Lisa, who asked “How do I get the apps off the bottom of my text screen. Who had that bright idea?” for the question and tip idea! How do I find out which folder I’ve put an app in ? The Spotlight Search in the new iOS just says everything is in a generic ‘Application’ location. This kind of thing is so juvenile, nobody wants this stuff in Messages on the iPhone. Why does Apple bother to put a bunch of teenage toys in messages where adults have real conversations including business and professional discusses? It’s an insult it can’t be disabled but only ‘hidden’ by some mysterious effort that nobody would figure out on their own if not learned on a website like this. Who does Apple even make products for anymore? A teenager can’t afford a $1000 phone so why are they focusing on teenagers? Maybe they should ask adults what they want? How about a return to the simple, easy, problem free, clutter free environment that Apple was known for until more recently? The only bigger mystery is that while Apple flails into poor design and bad product decisions that another company hasn’t come to offer something cleaner or easier or better. Google could clean up Android and lock it down and it would be a strong competitor, or Microsoft could double-down on the Windows Mobile effort rather than backing away from it. The whole “apps” thing is overblown and not what most users need, most users need web, email, messaging, and a good camera. The only people who want these type of apps and gimmicks are teenagers. Sorry but I am ranting here because I am totally annoyed with these type of “features” being implemented that we are unable to remove. All the while iOS eats battery and is slower than ever before. Apple feels like Microsoft in the 90s full of arrogance and convinced their user base will never leave them…. but with enough mistreatment and problems people are not loyal to a product just as that product is not loyal to them. Something to think about, but I’m sure they won’t. I totally agree. If anything, Apple should have an “adult” user mode that turns off all this crap. They want to put in all this useless, processor-hogging stuff that the tweenies can waste their time with all day, fine…but let me turn it off. Let me use my goddamn $1000 phone as a tool, a utility, that it is. It’s not a toy for me and never will be. So sad the turn Apple has taken. Jobs is rolling in his grave. I agree. Offer simple too. Some of us really don’t want the distractions and want the efficiency of a device that makes life simpler. Thank you John S. Apple’s claim to fame and success was Steve Jobs’ clean, simple, intuitive design. He should be spinning in his grave as clutter and confusion continue to infiltrate Apple products. Hardware remains sleek; software not so at all. In addition to this latest insult, there is the absurd photo app with its nonsensical album categories. I’d switch to android, but it’s a hacker’s toy. You can thank that TIM COOK and his extremely poor ability to lead a company. He may be a good finance man but he sure is not worth 2 cents as a CEO. Steve Jobs would roll over in his grave if he knew how Cook was running Apple. This is annoying af apple however, cmmmonn no good !!!!! I just switched over to apple don’t make me switch back ! If you scroll to the right of the app icons under the text entry bar there is an option for “more” – here you can disable all the apps except for Store, Digital Touch, and #Images – not perfect but a little cleaner. Found that the 2 buttons for appstore and camera both dont work when MMS messaging is turned off. Makes sense for the camera icon but why it doesn’t allow me to get rid of the imessage appstore bar when mms is off is a mystery. I cannot turn off either the blue or grey App Store icon that affixed itself to the right of my texts after this new update. It is awful. I do NOT want or need this link during texting. Tapping and swiping do nothing but take me to the App Store. Is there any way to ditch this thing? Regards! Is it so that these icons are the most or recently used apps? Or just random apps on your phone? I have the latest iOs but this app drawer thingy just won’t let itself be hidden. I tried turning iMessage off, so just plain text SMS. The grey A button still will not hide anything. I’m screwed. Hate everything Apple has done since 2008 or so. Arbitrary and invasive. And childish. Am I the only big finger klutz that accidently so often hit the send button on iMessage when trying to insert the cursor when close to the right margin?? Don’t you wish they move this thing to another location???? I agree with John S and most of the other adult users that said iphone is catering to children when we, the adults have the money to pay for these phones and this service. I’m tired of all the little BS we deal with (stupid little time wasting icons that automatically pop up when we’re forced to update the ios and all my setting are messed up, it’s like I had the phone how I wanted it and the update makes it like the advertisers want it. I don’t have time for this childish crap. I will switch from iphone to anything else to try it (android, google, microsoft, whatever caters to professionals and adults).